We are very grateful for all the musicians that continue to speak the one language that bonds all of humanity! We are a small outfit with limited resources but our passion for gear is immense. Please help us spread the word and contact us with your suggestions. Thank you to our loyal Twitter followers & Facebook likers. We appreciate you and thank you for letting us spread the word about the instruments we love. Training Snacks just finished writing this article for AMS to teach you the ins and outs of headphones. Don't just buy a pair because they look cool! Find the right pair for the job. From inexpensive ear buds to high-end studio monitoring headphones; its all here in this guide. We recently had a look at the beautiful, silver-finish, DDJ-SZ. It's not only built like a tank, but features the superior audio quality that high-end Pioneer equipment is known for. They've thought of everything for this one and if you use Serato, its a no-brainer on picking one up to take your DJ sets to the next level. This is a professional-quality controller/all-in-one system with 4 channels. Its not only specifically designed for Serato DJ Software, it also combines key features from Pioneer's CDJ and DJM series, making it the perfect choice for those experienced with CDJs looking to leave those ancient discs behind in favor of digital files. Side note, regardless of what system you use, TrainingSnacks urges all digital DJs to try and use Wav or 320kbps MP3s so that your audience not only hears what you're playing, but FEELS it! Upon trying this unit, you'll feel the build quality. Every knob and fader is firm yet smooth. The CDJ-style jog wheel response was immediate and accurate, as is the display which shows the position of the track. The EQs are highly useable for killing frequencies to build momentum in your set, and the onboard effects feature a quality not found on less expensive solutions. We're talking lush reverbs and other-worldly delays. Calling the DDJ-SZ fun is an understatement. Playing around with the 16 multi-color LED rubber pads (which can be assigned to a variety of on-the-fly remix functions), made us feel like improvisational musical masters. Chop up samples, play cue points like an MPC (the velocity sensitivity is super responsive) or perform tight rolls. The way it integrates with Serato will make you wonder why you didn't buy this the day it came out. It was easy hooking this up to a computer and the built-in audio interface had no noticeable latency. This didn't surprise us as Pioneer is known for having the best audio quality in the DJ world. One thing to be said though is YOU DON'T NEED A COMPUTER to use this. It can be used as a standalone mixer, making it a great transition for old-school DJs. Best of all is the silver finish is exclusive to AMS, so having one of these will set yourself apart from all the other DJs that own it in traditional black. A look at the connections. The dual USB ports are for switching out computers (for multiple DJs using the same controller). Also notice this microphone input can accept XLR cables, a sign that this beast is for pros. 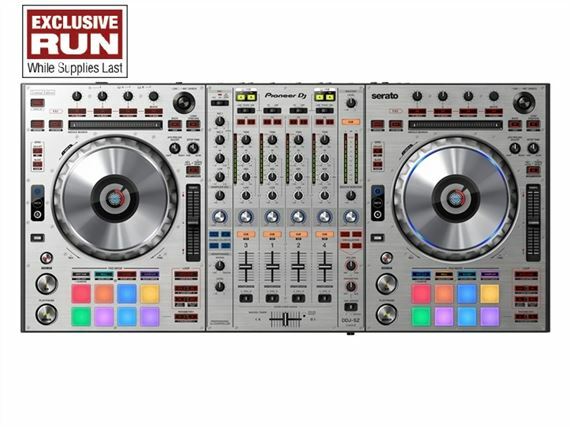 Click here for a Free Extended Warranty for the Pioneer DDJSZ DJ Controller! Here's a cool info guide that will teach you what type of gear you need to create the sound associated with different genres of Heavy Metal. While we are personally a fan of everybody creating their own style from within, its still great to learn how certain sounds are achieved, even if you are not into heavy metal music. What is Phase Cancellation & Phase Shifting? This video will teach you what phase cancellation & phase shifting are, as well as how to fix these issues using Eventide's Precision Time Align plug-in. Printed MIDI is a combination of printed capacitive touch, MIDI processing, and BlueTooth. It can potential turn any surface into a MIDI controller as demonstrated by DJ QBert's album cover. It uses Apple MIDI Bluetooth protocol and can be used to control a variety of MIDI enabled applications on computer, smartphone, an tablet. We think it's downright bananas. Collidoscope - the Synthesizer Built for Two! This hybrid keyboard is made for two to play at once. It's part sampler, part super collider synth engine. The prototype, double granular synth was developed by researchers, Fiore Martin and Ben Bengler. Trainer extraordinaire, Matt Cellitti just got Native Instruments "Flesh" and shows us how he messed around with it, the first 5 minutes of ever using it. Seems like a really cool beat gridded sampler that manipulates audio akin to a few other programs we've seen, but in a slick NI fashion. We can't wait to get our hands on it! ​This beast is wild! The AlphaSphere is a new musical instrument that opens up music making to a new generation of musicians. Designed for composition, production, performance and learning, each of the tactile pads are pressure sensitive and ergonomically mapped around the surface of sphere. Underlying the design is a geometric notational logic that allows the custom mappings to be created between different pads. Click here to pick one up! This is the easiest way to perform with one guitar and two amps, or two guitars and one amp. We're also a huge fan of the MixingLink so be sure to check this as option that provides the above features along with a whole lot more.